I tend to be vocal about my criticisms of Antique Week. It’s not some internet attitude talking, but human nature; we tend to be more vocal with our complaints than with our compliments. So I figured it was time I gave Antique Week it’s proper due and give it a proper review. 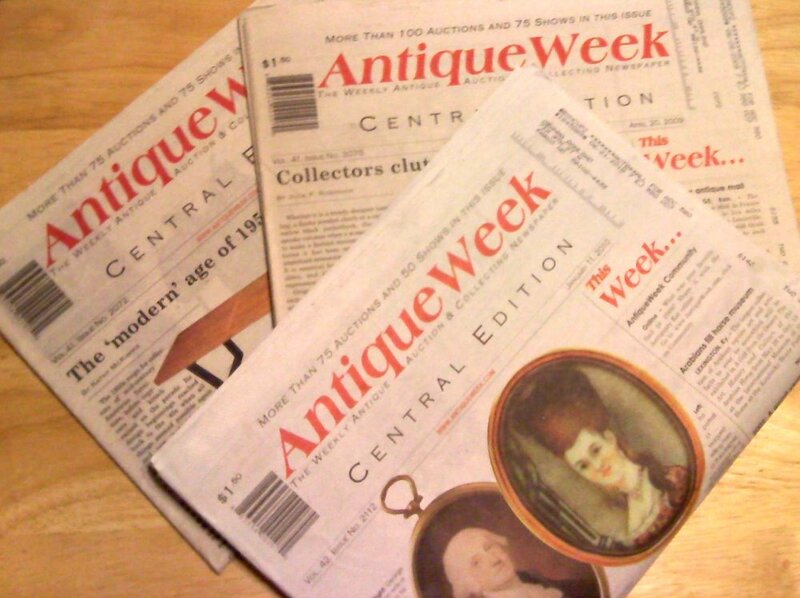 Antique Week is a popular industry publication for antiques and collectibles — and I say it’s an “industry publication” rather than a hobby publication as the weekly focuses heavily not only on pricing, but on information for dealers. Such marketplace information can be a bit of a turn-off for some, but this weekly newspaper (published on actual newsprint) contains lots of good information on antiques, art, and (mainly vintage) collectibles. There’s even a regular column by my no-so-secret crush (who I’ve met several times), Wes Cowan! While the newspaper is published weekly, not all the stories are timely. (Not to toot my own horn too much, but hubby and I have often beaten Antique Week to the reporting punch. Most recent examples include my article on the antique vampire kit was published October 15, 2009, theirs in the January 11, 2010 issue; and hubby’s article on the 1913 Liberty Nickel was published December 24, 2009, Antique Week‘s was in the January 18, 2010 issue.) But I don’t suppose that matters too much; we’re talking about old things, not social needs or political issues. Plus there’s lots of ads (from full pagers to classifieds) for antique shops, auctions, flea markets, etc. — including dealers and individual collectors who want stuff. You know when you hear folks on Roadshow etc. casually mentioning those specialized auctions held once or twice a year, or some private collection that’s been up for auction? Well, they’re (usually) found in Antique Week — and in time for you to plan to get to them (or make arrangements to view catalogs and bid) too. Each issue is in two parts: the first section features news and information by area (Easter, Central, and Western) and the inner National section. And as a subscriber, you have access to the website, where you can search archived issues, auctions, etc. Honestly, Antique Week is one of the few weekly publications I read every page of and save (though my saving of old newspapers probably surprises no one lol). So thanks, Mom, for renewing my subscription for Christmas! Right now, you can register for a free four week trial subscription to AntiqueWeek with website access. And you can send a friend a free week or sample issue. But my outfit was played with — well loved — first by my aunt, then by me. I love-love–loved this outfit. 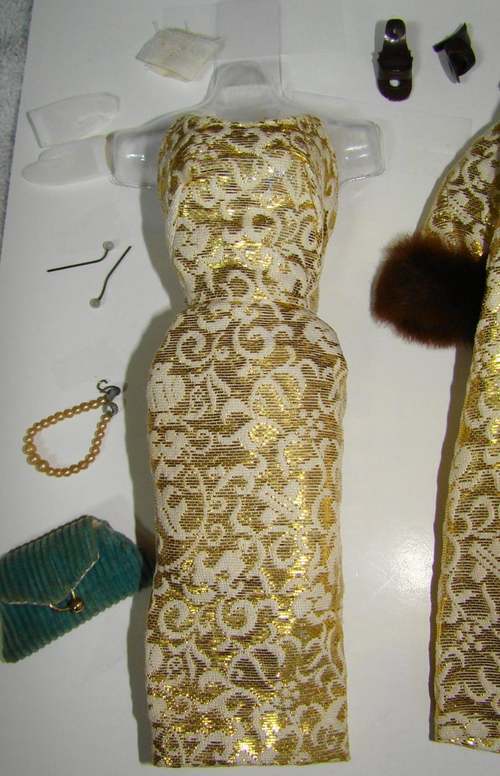 The metallic gold threads gleamed, making Barbie appear to wiggle in that wiggle dress, even when she wasn’t even moving. The coat had those elegant cuffs of fur set against that gold and then -BAM!- you opened up that coat, and there was that unexpected (or at least thrilling) gleaming aqua lining. And, believe it or not, that aqua corduroy handbag was paired with nearly as many other outfits as the pearl necklace and basic black shoes. I played with them all, but tenderly. Even still, I’m sure they wouldn’t approach the conditions of this one. And I don’t recall the fur and pearl headband. 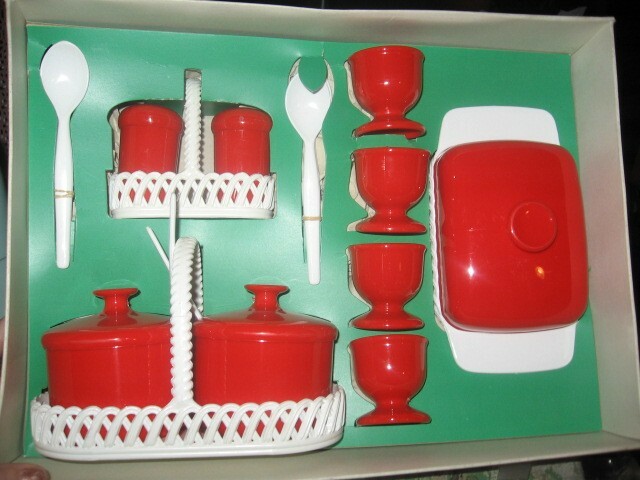 However, I don’t think a few hundred dollars would be worth parting with the set if I still had it — no matter the condition. A few grand? Mmmaybe. It’s hard to put a price on memories. Harder still to put a price on the hypothetical ownership retained — because right now, all I want to do it have it back and dress-up Barbie. 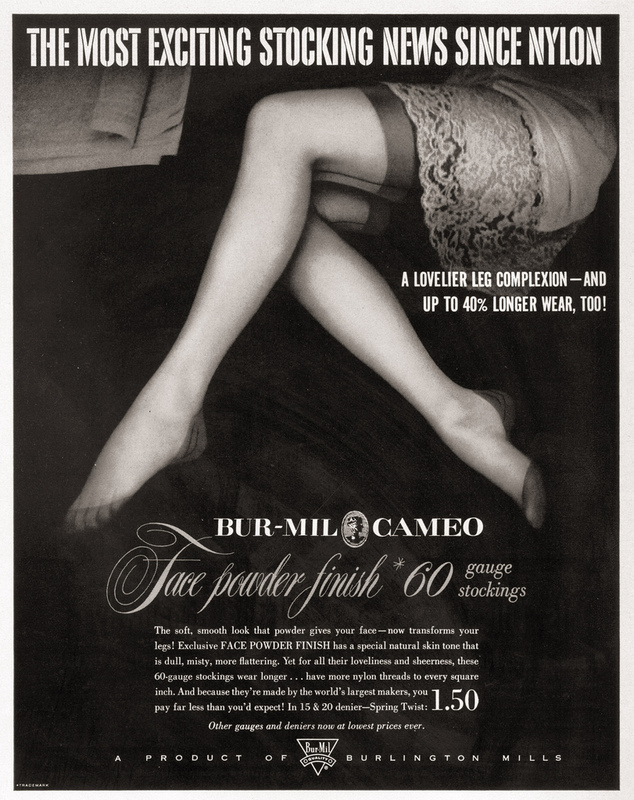 Although the outfit itself remained in production through 1964, only the outfits marked TM were manufactured the first year. 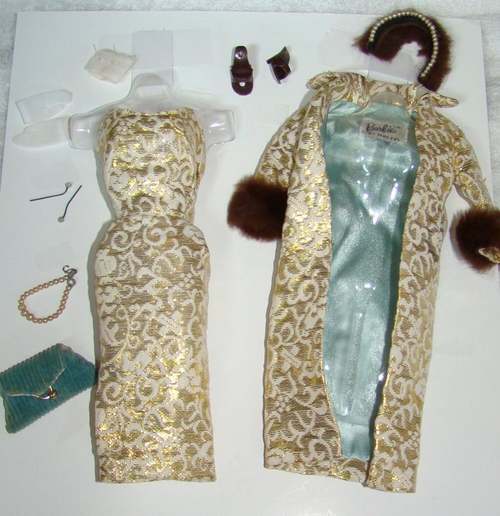 These outfits came with the #1 shoes with the hole in the bottom to accommodate the stand! The TM version appears to be “more gold” than the more common R version. The gold glistens and sparkles and provides a stunning contrast to the aqua satin lining! PS I obviously can’t recall if my outfit had the original, old, TM tag; but since Babs #1 was among the items given to my by my aunt, I’m pretty certain it was. Monday night was the premier of the History Channel’s American Pickers. This hour long show is the channel’s latest foray into the world of collectibles and antiques, following one of my other favorite shows Pawn Stars. So I was wicked excited to see it. 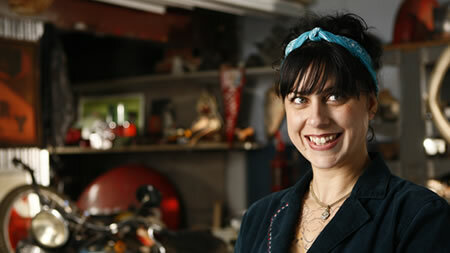 The show documents the actions of Mike Wolfe and Frank Fritz (friends since the 8th grade and business partners in Iowa-based Antique Archaeology) and Danielle Colby Cushman (who holds down the fort back at the shop), folks who make a living off doing the work that some collectors and dealers won’t: not only crawling through farms, sheds, garages and junk yards to spot the gems, but willing to ask the dreaded question, “How much?” and then dicker over price. For some of us, this isn’t so much something we wouldn’t do, but something we simply don’t have time for. (And this is how the pickers do more than survive but thrive.) For me, this is my dream job. It’s not just that I’d like to turn my hobby of digging around for stuff into full-time travel adventures, but I really, really, have a fondness for what hubby and I call “old coots.” I love old people, especially old men, with stories to tell — and quirks, I love quirks. And American Pickers finds them and shows them to us. Like Bear, the guy who was a second generation carny with 35 years worth of old carnival equipment and rides. I don’t recall the names of the other charming old men who we met in this first episode, but hubby can attest to my rapt attention and squealing during commercial breaks — both of which express my excitement and delight with the show. So American Pickers satisfies not only my need to see more junk but to meet more old coots. But maybe you have different needs? For those more seriously interested in antiques and collectibles than living vicariously through the day to day fun of what Frank, Mike, and Danielle do, there are more practical matters included in American Pickers. There’s the obligatory math analysis of how much paid for the item, it’s value, and the resulting (at least potential) profits. There’s the history of the objects found (another obsession of mine). And there are tips and tricks too. Such as the best places to pick are at houses and properties without satellite dishes and new vehicles, that you always get the owner to name his or her price first, and that, no, you don’t always get what you want. 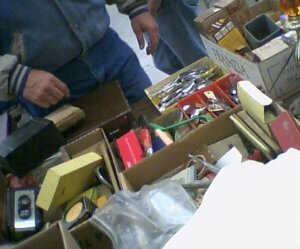 If you’re new to collecting, never been so knee-deep in dirty stuff as a collector, or just want to brush up on your antique hunting and negotiating skills, there’s plenty to learn (or reaffirm) from Mike & Frank. Personally, I’ll continue to watch for the eye candy — the antiques and the old coots. And I’ll keep hoping for my future career as a traveling picker — who writes from the road. 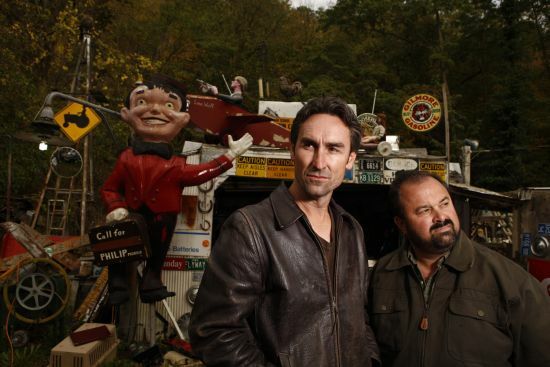 Locally, original episodes of American Pickers are on Monday Nights, up against NBC’s Heroes. 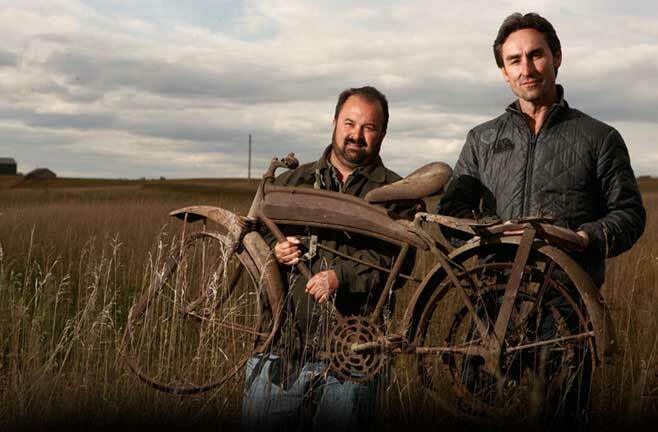 I used to watch Heroes religiously, but it’s no contest: The American pickers are my real heroes. 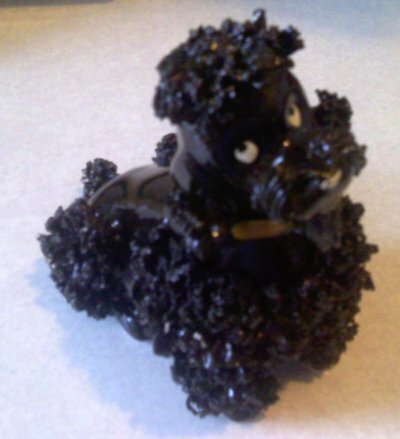 When I was a kid, I had a number of vintage spaghetti figurines — mostly poodles. Sadly, I sold most of them at family rummage sales as I got older. 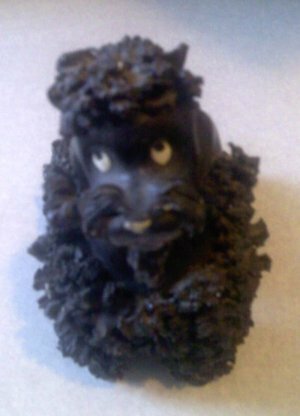 So when I spotted this black poodle with the familiar ceramic spaghetti fur for just $2 at a local thrift shop I had to take him home. Even if he is not perfect. The most obvious problem was a long stripe down his back where someone had likely priced him for sale with masking tape. 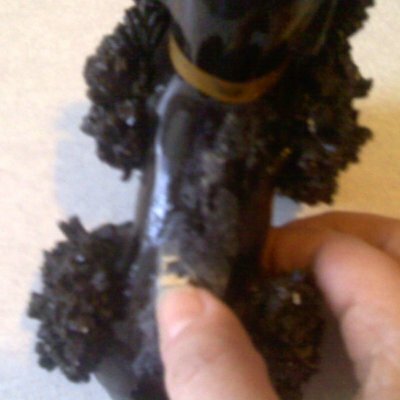 (Lack of concern for damages to items when pricing them is a huge pet peeve for all collectors.) 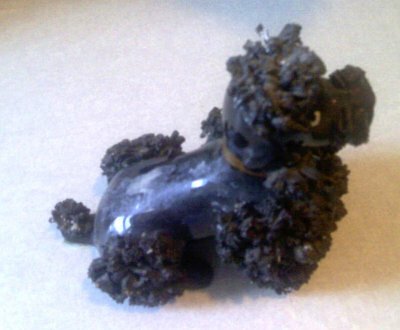 And his ceramic spaghetti fur was covered in dust and dry ick. 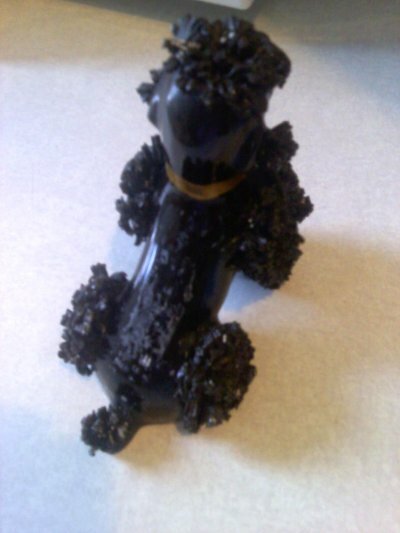 In short, Blackie the vintage poodle figure was begging for a bath. 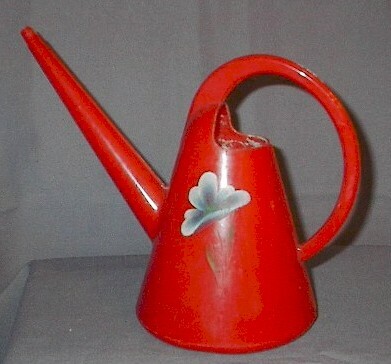 Before I share my tips on cleaning old figurines, please note: Do not wash or submerge any pieces which have been glued or repaired as the water will likely seep in and, if not dissolve the fixative, can crumble away the weakened pottery itself. 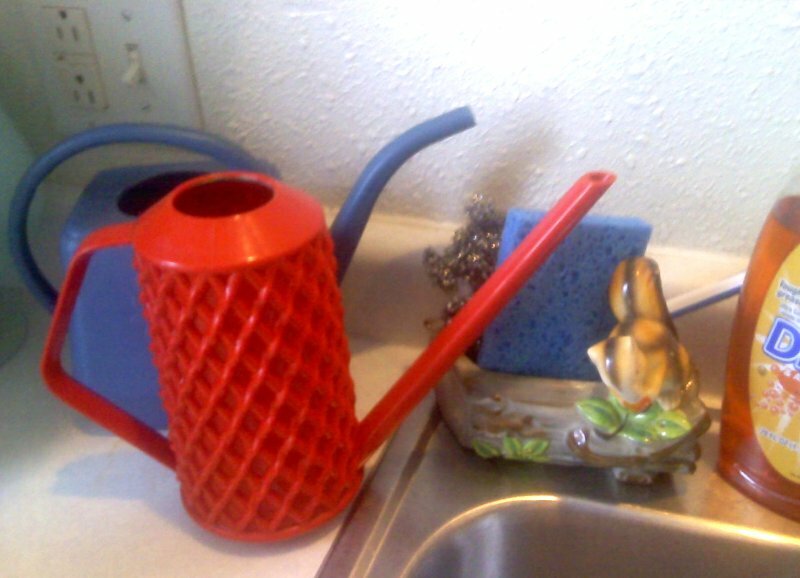 Do not wash or submerge vintage chalkware pieces or any pieces which do not appear to have been fired. 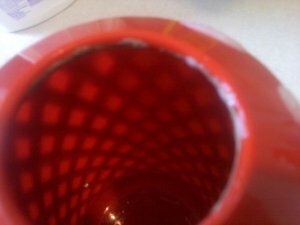 The best way to remove sticker residue and other goo from pottery, ceramics and even (many) plastics is with liquid soap. Rather any liquid soap, from dish washing detergent to hand soap or even shampoo will do. 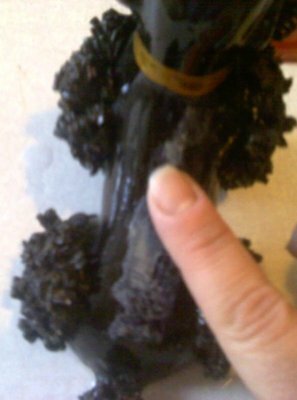 But you should always do a small test of both the cleaning product and the tools you are using, preferably in a place which won’t show, such as the bottom of the piece. 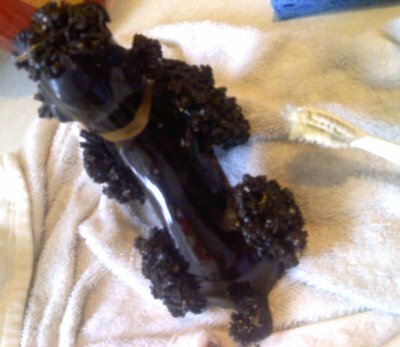 First I like to rinse the piece. Just to get all the loose stuff off. Then take a finger tip full of liquid soap and apply it directly to the areas affected by the sticky residue. Rub it in good and then let it sit a few seconds to soften the residue. In cases like this vintage figurine, the sticker residue has aged and set so well that while you do make progress, not all of it will come off right away. Simply apply more liquid soap with your finger tip, let it sit, and scrape again. You may wish to rinse or wipe the piece with a damp sponge to make sure you’re removing all of the loose bits of residue you’re scraping off. 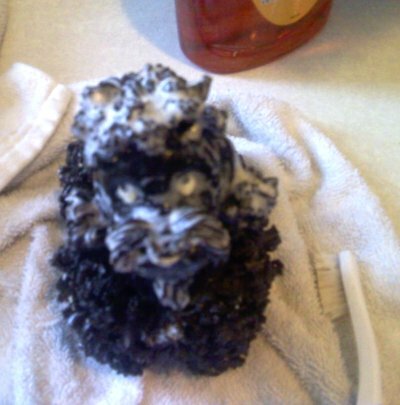 This may take repeated efforts, but eventually the oils &/or emollients will break down the residue. Now to clean between the ceramic spaghetti strands. 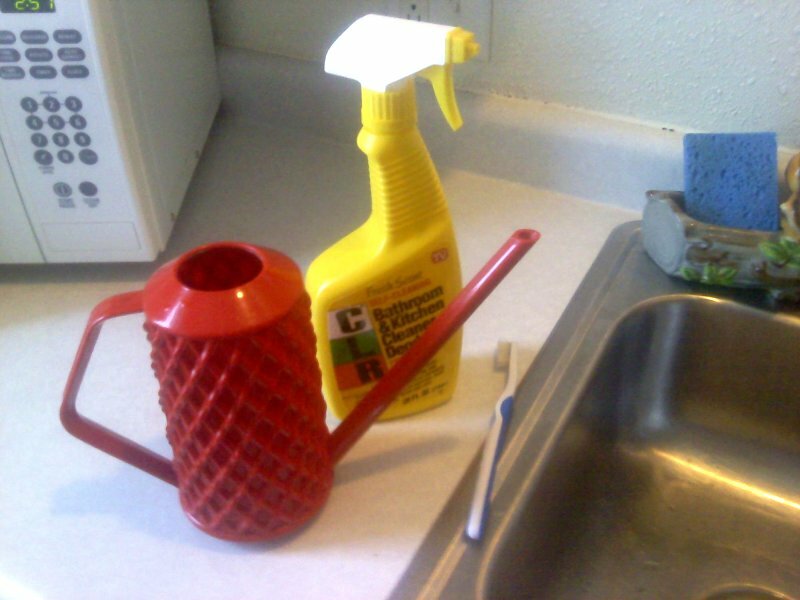 This is best done with a toothbrush (I always keep toothbrushes in my cleaning kits). 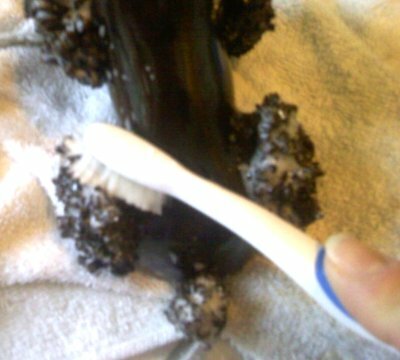 Wet the toothbrush, apply a bit of the same liquid soap, and gently brush it into the ceramic fur and other crevices of the figurine, creating a lather. Be especially careful where there are damages, paint that you have not tested, etc. But overall, a light brushing with the mild soap won’t do anything but remove the dirt. The rinse off and gently blot the piece dry. 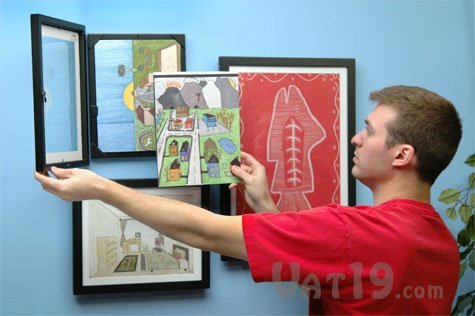 Let it sit on a towel to try before placing it back on the shelf, especially if it sits on a wooden or painted surface. Now Blackie’s clean. But he’s still not perfect. He’s got a number of places where the tips of the spaghetti strands have been broken; the white ceramic spots are obvious to the collector’s trained eye, even if he looks great on the shelf. So I’m leaving him alone. But if your spaghetti figurine is going to remain yours, there’s nothing wrong with taking a permanent marker and placing a dot of color on the bare white ceramic and hiding the flaws. The first bit of Cade’s news is regarding some of that previously mentioned presumed-lost silent film footage: Six minutes of Annette Kellerman (also billed as Annette Kellermann, “The Perfect Woman”) in the big budget silent film Neptune’s Daughter (1914). 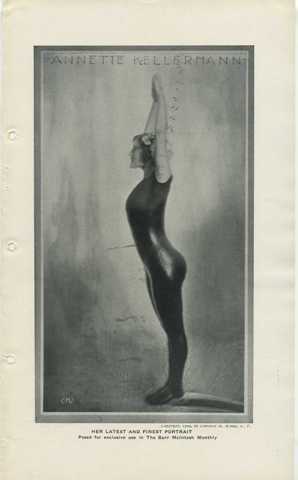 While researching for a seminar on Annette Kellerman for Australia’s Powerhouse Museum, Einar Docker found Cade’s article on lost film at Silents Are Golden. During conversation about using Cade’s research in his presentation, Docker, the museum, and Australia’s Screensound archive were blown away to discover that the six minutes of film existed let alone that Cade knew where it was and that it could be viewed. Along with crediting Cade, Docker will be sending her a copy of the museum event on DVD and he was able to get her a copy of Kellerman’s short, Jephthah’s Daughter (1909) from the BFI archive. You may not think getting a copy of a film isn’t very exciting, but this isn’t like buying or renting a DVD. This is a whole other animal indeed. We’re talking about films which have not been commercially re-released, many of them have not been seen by the general public in nearly a century. They reside in film archives, like the BFI or Gosfilmofond of Russia. If you live in a community that doesn’t have silent film screenings, or only has screenings of the more popular silent films (films made more popular because enough people have seen then in the past 100 years to be fans and request them), you have to travel to an archive to see them. (If you think today’s movie theater prices are high, add in international travel, hotel lodgings, meals and suddenly you’re all too happy to buy ticket — and the over-priced popcorn.) Of course, you can try to purchase copies of old films… The prices vary considerably from archive to archive, with some charging minimal amounts for films while others may charge over $1000 for a copy of a film. So for folks like Mary, who take being a film fan to a whole other level, receiving copies of such rarely viewed old films is a dream come true. My feeling is that these films are the only legacy that many of these artists have as their testament to show they were a part of history, part of this planet, and that they made a contribution or a difference in some way while they were here. It is not fair to the artist when they are held hostage in some archive and should be made available to the public for viewing. Some of these films that are held hostage in archives have been in that state for almost a century, which I think is criminal. It’s like someone who has a precious gemstone or car. What good is it if you can’t show it off to others? What good does it do to hide it away from everyone else? I think this is selfish and serves no real purpose whatsoever. Jeesh, I have trouble finding just one movie from the 1980s that I want at Blockbuster. No wonder this is one collector who impresses me. And this isn’t even all her news! 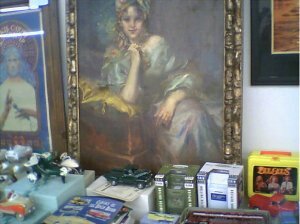 Come back soon for more on Mary Ann Cade’s silent film collecting and movie collectibles. Photo Credits: Annette Kellermann photo from the October 1909 issue of Burr McIntosh Monthly, courtesy of Cliff Aliperti. 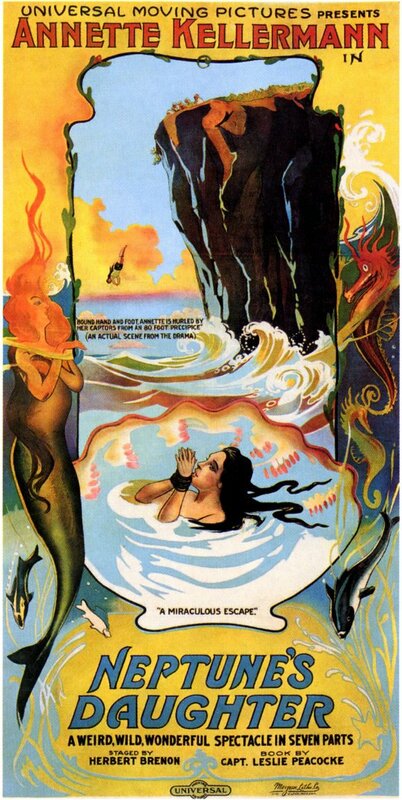 Reproduction Neptune’s Daughter film poster, via MovieGoods.com. 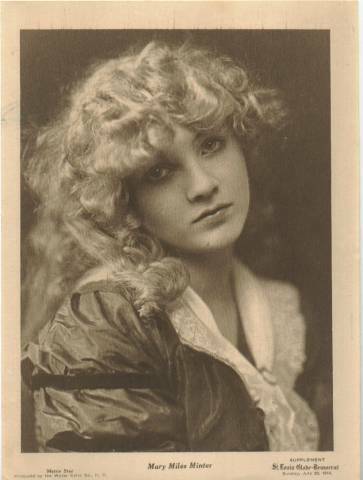 Mary Miles Minter photo on St. Louis Globe – Democrat Water Color Company Premiums (1916), also from Cliff Aliperti. 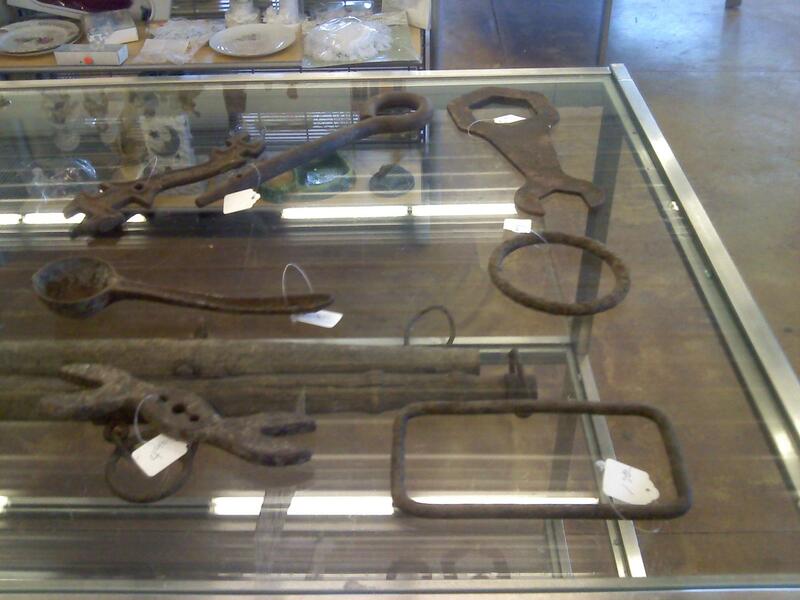 I like old tools, folk art, things are hand made but not perfect. I once bought a piece of wood with string wrapped around it — it seemed to perfect as an object — and I knew I could never create that type of thing, but the person who made it did it for practical purposes and I just thought it was great… Of course, my husband just rolled his eyes. 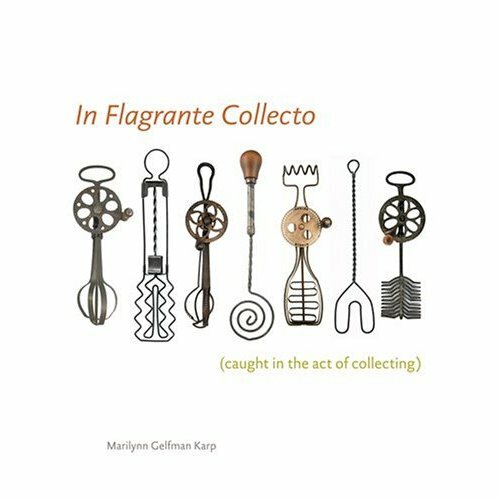 Oh, speaking of that kind of collecting, do you know the book In Flagrante Collecto (Caught in the Act of Collecting), by Marilynn Gelfman Karp? Put it on your wish list! It’s amazing — beautiful to look at, wonderfully written, and the collections in it are from things like bird nests to old paper ephemera. The biggest worry in my mind these days as I toss and turn in bed the waning days of the year has been what to do with 13, four-drawer metal filing cabinets full of my life’s work in the form of negatives, slides, transparencies and prints. I can be objective enough about my own output to know that they are worth money. But to whom and when? Probably when I am dead someone will have a peak and realize what I know now, and that is that I have a diverse treasure of Vancouver’s everyday life since I arrived in 1975. This all made me think of my own personal classification which is not really cross-referenced and installed into some sort of computer program. My filing system is alphabetical and depends on my memory alone. If I forget a person’s name I cannot find the file. This is my problem. 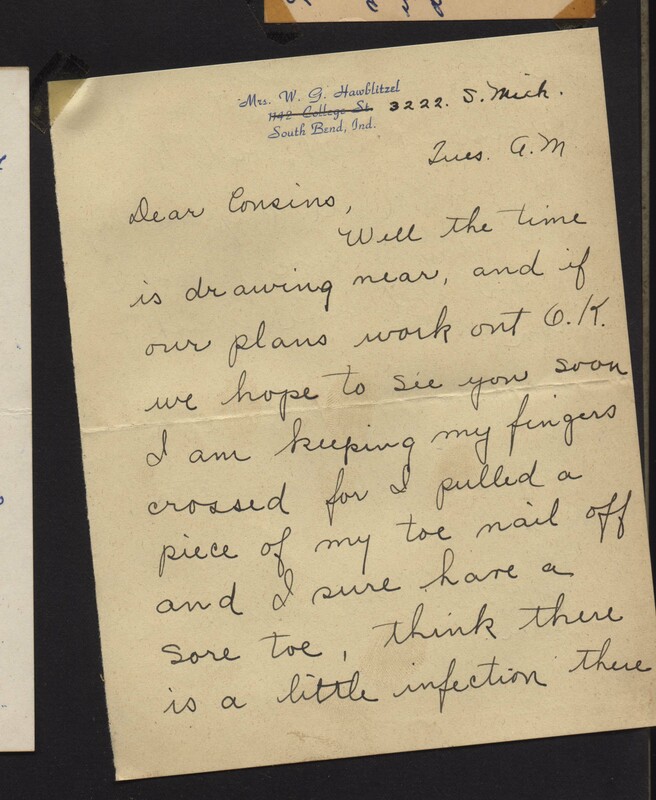 Organizing collections can be challenging, but it seems worst with ephemera. At least for me it is. Unlike pottery or glassware, figurines or even books, ephemera is not so readily displayable. At least not in the quantities I have it in. I don’t even have an alphabetical system; all my vintage magazines, antique photographs, old postcards, etc., are lucky if they are lumped together by those simple categories. I’m not a bad collector or a lazy collector; I’m an overwhelmed and confused collector. I’ve pondered, many times, about organizing my ephemera. You’d think vintage magazines at least would be easy: sort and store them by publication title, placed in chronological order. But you see, I don’t look for articles, images, or whatnot by “May, 1958, Cosmopolitan Magazine.” My continuing fascination, inspiration and delight in collecting vintage magazines due to the serendipity of going through each issue, page by page, and making discoveries. It would be nice to be able to, after making such discoveries, organize each issue by some sort of theme… “Advertisements,” “women’s history,” “humor,” etc., so that I could find them again. But any magazine, then as now, has so many themes. How would I know that the magazine I filed under “humorous ads from the 1950s,” would also contain a great feature on “women’s sexuality in the 1950s,” and a dozen other categories? While Alex’s post provides more food for thought, I don’t have any real answers yet. I won’t stop tossing and turning at night — or collecting by day — until I do. So I’d love to hear from other collectors about how you’ve organized and/or categorized your ephemera. Photo credits: Photo of a young Alex reading from Alexwaterhousehayward.com. What I like about these Lil Davinci Art Cabinets is the fact that each cabinet is a storage container as well as a display piece, holding up to 50 sheets at a time with a spring-loaded pocket. That means you can store multiple pieces of artwork — and ephemera — in one place, with the one in front on display. The hinged door opens from the front, giving you easy access for rotating what’s seen as well as keeping other pieces within reach. I’m thinking they’d work wonderfully for protectively displaying vintage magazines! The art cabinets come in two sizes: The Li’L DaVinci (8.5″W x 11″H) and the Big DaVinci (12″W x 18″H). 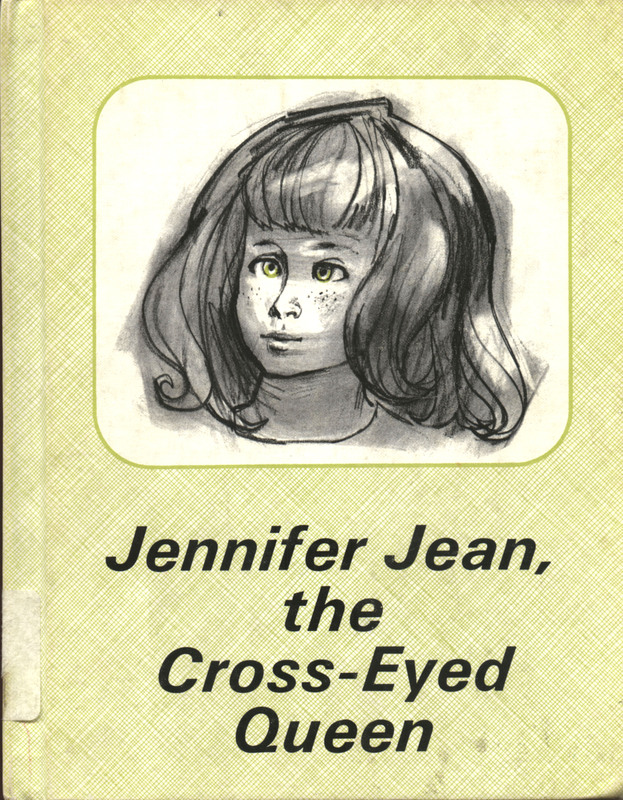 As I said, I don’t sell too much online anymore (I’m too busy blabbing about the stuff I find to list much), but recently I did sell this copy of Jennifer Jean, The Cross-Eyed Queen (by Phyllis Naylor, illustrated by Harold K. Lamson, © 1967; this was the Third Printing, 1970, Lerner Publications Company). The other children tease her. 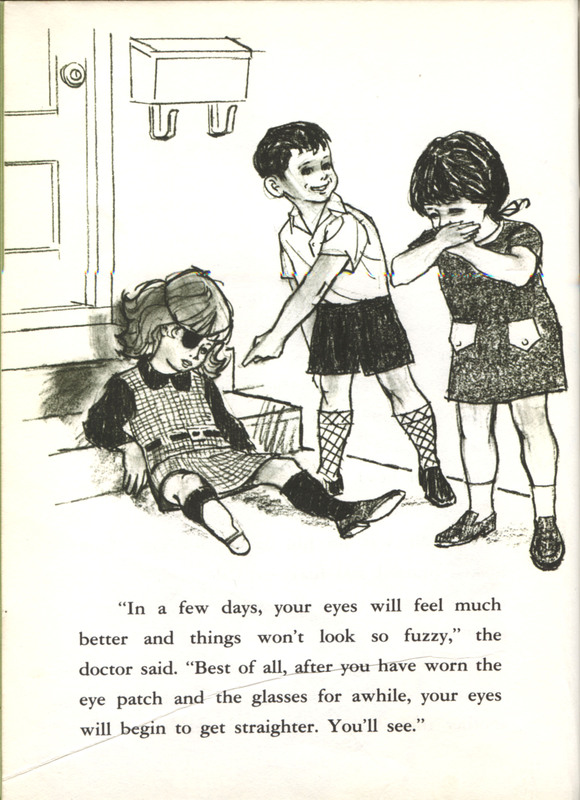 Her parents take her to the eye doctor; first she must wear an eye patch, then glasses. The other children continue to tease her. Until everything is set straight all ends well. When I bought the book and listed it for sale, I told the story of how it reminded me of my cousin Tina’s plight. But this isn’t the story of Tina, or any of my own memories, really. It’s the story of the book’s new owner — or at least what I gather about the purchased vintage book. Sometimes buyers will tell you why they simply had to have something; sometimes they don’t. Sometimes I dare to ask… But in the case of a cross-eyed girl item, it just seemed too impolite. And it probably wasn’t necessary either — for Jennifer Jean was shipped to another Jennifer (middle name unknown). In my decades of selling old books, one of the most common themes for collecting books I’ve encountered is the namesake connection. 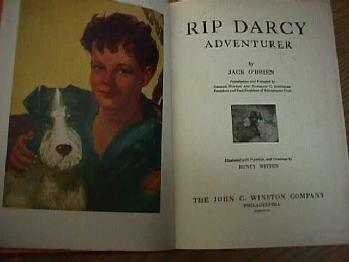 Moms & dads who buy books containing their children’s names in the titles is a-parent-ly quite popular; I’ve sold two copies of Rip Darcy Adventurer, by Jack O’Brien to parents of children named Darcy — not to terrier lovers, as I had anticipated. The first copy went to a new father of a baby girl who was collecting books with her name in the title so that one day, when she was older, he could present her with a grand collection of all books Darcy. 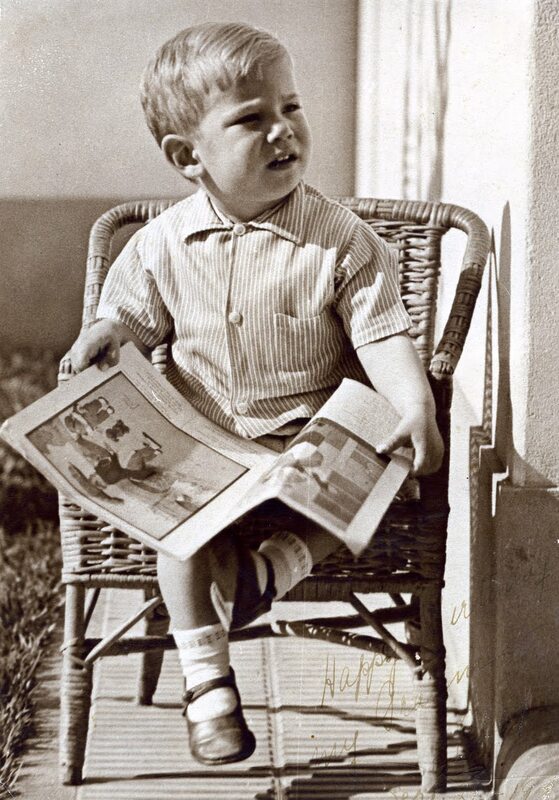 The second copy went to a mom desperately trying to keep her young son, Darcy, interested in reading. So I probably shouldn’t ever have been surprised that people collect books for their names. In fact, it seems to be a far more popular reason for collecting books than first editions. But then again, that’s just anecdotal evidence based on my experiences, and I don’t find many first editions to sell. Preservation Of Heirloom Textiles, Collectible Clothing, Etc. 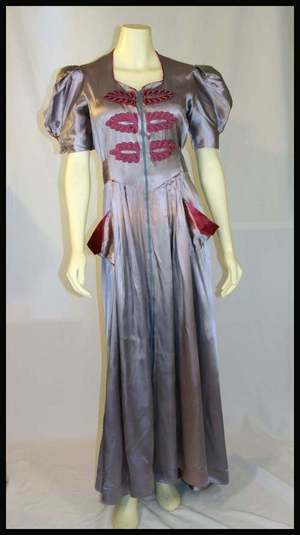 This stunning 1940s dressing gown in silver grey satin with raspberry embellishments, serves not only as a reminder of just how lovely vintage lingerie can be, but also to properly store your clothing because this beautiful old dressing gown has color transfer marks. Sometimes these spots are not permanent, but remember to use archival tissue when packing away your collectible fashions, your own wedding dress, etc., and you’re more likely to avoid them to begin with. In fact, as a general rule, any valuable textile not in continual (or rotational) use at least every 2 months, should be properly stored and put away to preserve and protect them from damages. 2. Look over the textiles for any damages. If you discover insects, mold or mildew, isolate the item in a sealed container immediately so that these live things (yes, mold and mildew are as alive as insects!) do not spread to other textiles. 3. Clean hands only. As oils and dirt, etc., can be transferred from your hands, causing future damage or deterioration, it’s best to wear archival-quality gloves. If you do not have such gloves, begin with clean hands — and wash & dry them as needed to ensure they remain as clean as possible. 4. Textiles and clothing to be preserved should be stored in special archival boxes only. 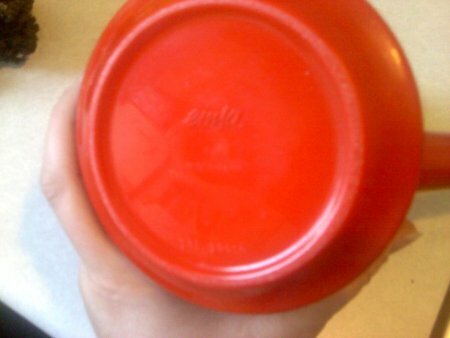 Never store valuable textiles in plastic containers (or even ‘protectively’ use plastic wrap) for two reasons: One, plastic deteriorates over time, creating poly vinyl chloride gases which may cause fabrics to yellow; and two, plastic does not breathe, which, with temperature and humidity changes, may encourage the growth of mold and mildew. Longterm storage of linens and textiles in a cedar or wood chest is not recommended. 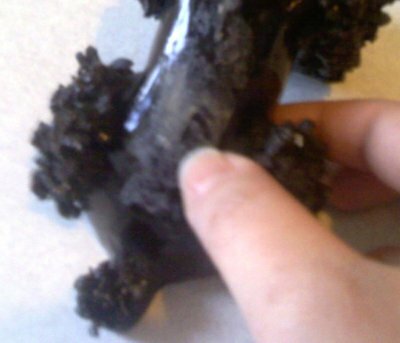 Wood fibers contain acid which, when in direct contact with textiles, may cause deterioration and decay of the material, often resulting in dark yellow or brownish stains. While these stains may be removed (via the use of bleaching agent, for example), the fabric is weakened by both the exposure to the wood acid and to the bleaching or cleaning agent. 5. For the best results fine vintage linens and textiles should be carefully stored in acid free tissues. There are two basic types of acid-free tissues: Buffered and Unbuffered. Buffered tissues are ideal for wrapping and padding cottons or linens, this acid-free paper has an alkaline buffer or Alkaline Reserve (commonly a calcium or magnesium salt) to help prevent acid migration. (Buffered tissue is a little stiffer and more opaque than the unbuffered tissue.) 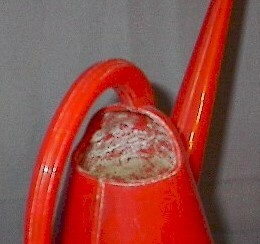 However, this alkaline buffer can be damaging to silk or wool objects. So when in doubt, or for general textile preservation purposes, go with unbuffered, or pH neutral acid-free tissues. 6. Acid-free tissues are used to prevent folds and abrasions between textile surfaces. This is done by stuffing and interleaving (placing or layering of barrier sheets of tissues). Lightly stuff any sleeves, bodices, etc. with archival tissue, giving clothing a three-dimensional shape and so keeping any fabric from laying or rubbing against itself. Multiple layers of tissue are sandwiched between the front and back layers of garments; apply generous layers of tissue to protect fabric from metalwork such as zippers, hooks & eyes, etc., as well as decoartive work such as beading, to avoid rubbing and imprints. 7. Prepare the box. Before placing the clothing in the box, line the box with sheets of the acid free archival tissue paper and loosely cover the item, so that it is fully wrapped in tissue (rather like hiding a sweater in a gift box). If the garment is so large that you must fold it to fit in the box, ‘stuff’ the fold with crumpled archival tissue paper (so that the fold doesn’t lie perfectly flat or make a sharp crease) and layer the garment with other tissues (so that the fabric does not fold back upon itself). 8. Clothing items should be individually stored in special garment-sized archival boxes; but you may pack away several smaller items in a box, as long as you don’t overload the box &/or “smash” the clothing or tissue. 9. Where to store the box/boxes? Sunlight is damaging for all textiles, so dark is a given. But avoid basements, attics, and other locations with extreme temperatures &/or humidity as well as great fluctuations in temperature and humidity. Simply put, the best place for storing the properly boxed textiles is where the living is most comfortable — on levels of your home that you live on. Closets in an interior wall, under your bed, etc. are typically the best options. 10. Ideally, these storage boxes are opened at least once a year, the textiles and garments unfolded, larger pieces such as quilts are aired out (inside, away from direct sunlight) and then refolded differently before being stored again. 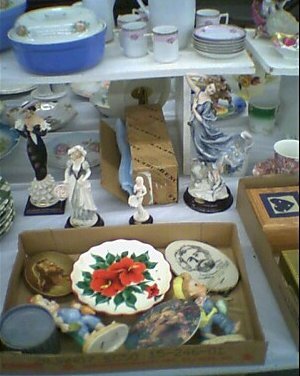 Posted on December 17, 2009 August 16, 2011 Author DeannaCategories Fashion, The Hobby Of CollectingTags antiques, caring for your collection, collecting, heirlooms, linens, preservation, textiles, vintage fashion guidesLeave a comment on Preservation Of Heirloom Textiles, Collectible Clothing, Etc. To me collecting has always been about amassing and organizing, maybe a little displaying, definitely learning, and combining those last too a little bit “I know something you don’t know,” which is by all means a mature enough reason to start this story when the bug first bit, age 6. My entry into the world of collecting came as it did for many kids, and in the case of my generation most of their fathers too: baseball cards. 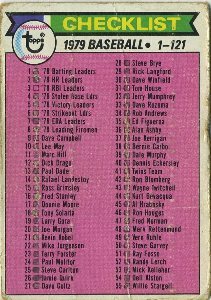 Oh, they’re so boring today with so many more exciting items having become accessible for collectors, but if you’re a six year old boy and it’s 1979 then there was nothing more accessible to collect than the baseball card. Looking back, as with most memories of childhood, it was very pure. To be quite honest if you took my computer away and I wanted to take up baseball card collecting today I wouldn’t know where to go to get started. But I remember where I got them back then, often it was the five and dime, sometimes the grocery store, but what sticks out most as I write this, perhaps because it seems so unusual to me now, was the ice cream man. For some strange reason I can recall like yesterday peeling open a wax pack and pulling out a Mickey Rivers card, maybe because Mick the Quick was the only beloved Yankee I got, who knows. My 1979 Topps baseball cards were interactive. I can recall keeping my cards sorted by team and laying them out in front of the television when a game was on. I’d place the 9 fielders in the appropriate positions and one by one bring the opposing batters forward as they came to the plate on TV. And sure I’d advance the batter base to base when appropriate as well. This led to my Yankees being the most beat-up of the entire bunch, but guess what, we didn’t care about condition then. The cards were educational too, of that I have no doubt. I learned long division once I figured out dividing hits by at bats yielded a players batting average. That led to a fascination with math which filled the hours by my inventing my own stats for my own baseball career which probably often wound down when I was over the hill in baseball years by, oh, right about now. Eventually I had amassed enough cards to presume I had the full set of 726. I took to sorting them and pulling the doubles out for trade later. 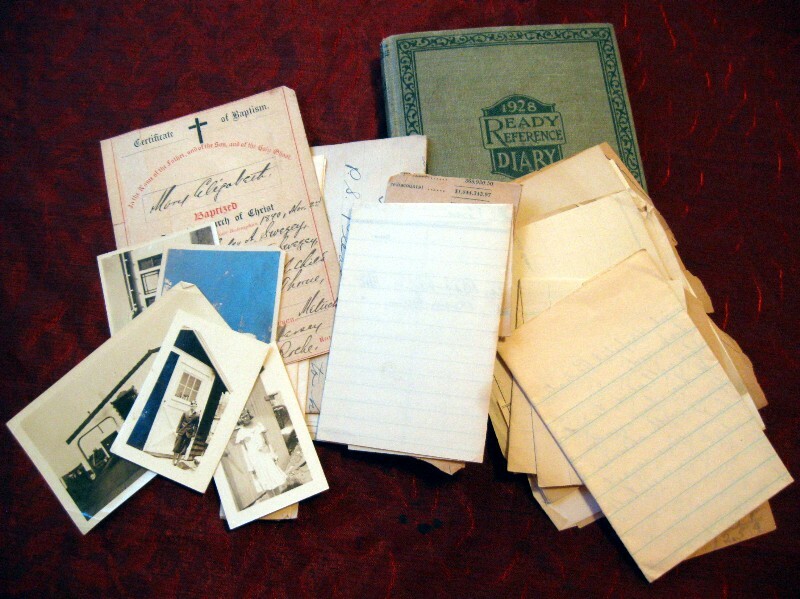 I actually remember sitting on the back porch with Dad one day as he did most of the work putting everything in order and actually using the checklists for their designed purpose–marking each empty box with a sharpened pencil. I can also remember how red his face turned when I became distracted and knocked the table over, but the less said about that the better. Now I didn’t buy my cards for the gum, but don’t think that that slab of pink didn’t offer some small inducement. I’ll even confess to growing nostalgic many years later and popping a 15 year old piece of gum in my mouth–the corners were sharp and it tasted like pure sugar. It didn’t last very long. About all that had held up was the familiar sweet aroma. Finally I can recall the day the purity was drained from my newly found hobby. My buddies and I used to flip and match cards, winner taking the amassed stack, and while a small form of gambling that was all right, it was still pure. No, the day everything changed was the day one of us picked up one of the earlier editions of Beckett’s annual price guides. I still remember the trade and since my guy eventually made it to the Hall of Fame I still hold that I won the deal on talent. If I didn’t know now what the price guide told us back then I’d still do the trade and I’d be right every time. I was going to get a Rollie Fingers card, who besides being the top fireman of the day with World Championships in Oakland behind him and already us kids whispering in reverence, “He’s a Famer,” also had/has one of the best mustaches ever and it was captured firmly on cardboard for all time to the owner of this particular baseball card. This was quite an inducement, especially at a time before any us could grow our own mustaches. The price was Bump Wills. Why did my friend want a Bump Wills card? I’m not even sure if I’d heard of Bump’s father, the much more successful ex-Dodger Maury Wills, at the time, but if I had I’m sure I used it as evidence. There was nothing unusual about this card. His stats read mediocre. 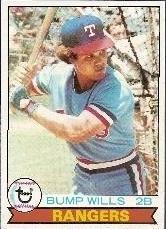 The rookie card craze of the mid-80’s had yet to hit, but even so this was Wills’ second card anyway. My friend peered into the Beckett book, his brother leaning over his side snickering in a way that as I recall it makes me want to find them right now and play some cards. Why? Now there’s no time limit on a deal, but still after several minutes of deliberation we were obviously reaching the critical juncture. Finally my friend and possessor of the Fingers card asked the fateful question: “Deal?” A deep breath on my part before responding, “Deal.” And so it was done. Immediate laughter, and I apologize for all of the detail, but you’re not yet familiar with Bump Wills’ significance in the world of late 1970’s baseball cards you’re about to discover just why this was so traumatic, so very horrible, that I still believe I can recall every single detail on the 30th anniversary of the harrowing event, unembellished, of course. “What is it?” I asked, knowing I’d had to have, in some way, goofed. They showed me the Guide. The 1979 Topps cards had a pretty full photo of the ballplayer taking up most of the card’s space with a banner running along the bottom edge of the card spelling out the player’s team. Bump Wills was a Texas Ranger and my card said “Rangers” just as it should have across bottom. But this was the corrected version of an error card which in all other ways was the same as my card but read “Blue Jays” across the team banner, pre-supposing a rumored trade which never did occur if I recall the story correctly. 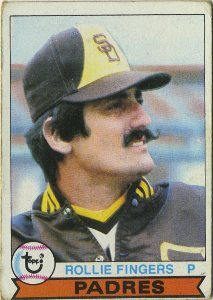 But the error card was only worth about a dime, which was fine, Rollie Fingers booked about a quarter. My memory is a little foggy here, but I believe the corrected version, the rarity which I had just dealt off, booked three whole dollars! Now in 1979 there wasn’t much booking for 3 bucks, at least not a lot of what we had, we were dealing in the cents column most of the time. I’d been had! I’d dealt the prize of my budding collection without even knowing it! From that day forward no deal was completed without consulting “the Book.” No more were deals based on wants, needs or even likes. Trades were balanced except on the rare occasion somebody would overpay for a card they needed for a set, or to complete a team set, or just a random hero Yankee–very rare times. Those deals still retained some of what made collecting so much fun, but the almighty dollar, or more accurately an otherwise unknown third party’s stated value, became the rule of the day across our childhood. Collecting is not always about the things; it is what they represent. Sometimes you hunt for things, specific things that you know exist. Sometimes, they are things you want back. Perhaps things from your childhood. A favorite toy can bring back simpler days, remind you of the bonds with your siblings. Or maybe you search for replacements for items that broke. Floral cups just like the ones Grandma had. Picking them up, taking them home, you are suddenly flooded with warm memories of hot cocoa with Grandma. Sometimes you search for things you never had, but know are out there, and need them to complete. Pieces to a set of china you wish to complete, or a volume in a series of books, or the missing piece in a game — some collectibles ‘complete you’ in that way. Other times, it’s the thrill of the hunt, the pleasure derived from the moment of “Aa-ha!” which completes you. In a world where survival is no longer based on hunting & providing by use of wits & skill, these exercises in collecting play with that primitive need to ferret & produce. Like a giant rack of antlers, items hunted for & brought home are symbols of our success. 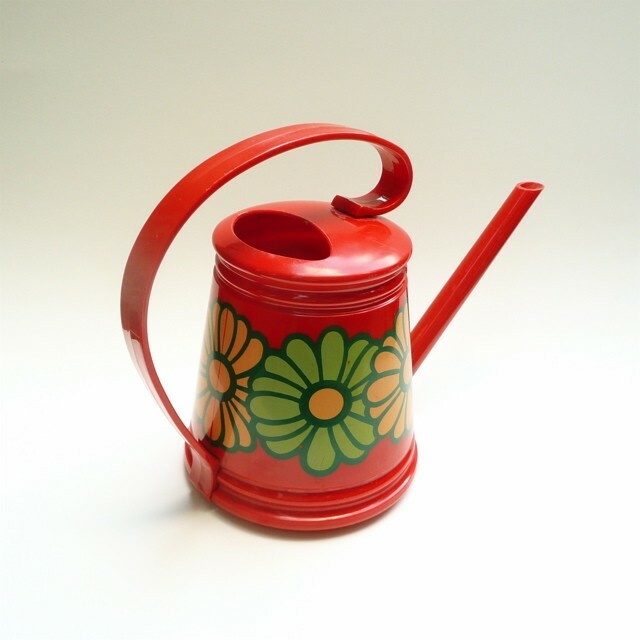 But there is also a great charm in the serendipity of collecting. Sometimes you run into things you didn’t even know existed, and you wonder how you lived without them. Such delights lie in dark corners of garage sales, in the bottoms of boxes not explored at auctions. Suddenly, you are face to face with this thing & you realize you must have it. This old recording you have not yet heard, this porcelain piece depicting some creature you cannot identify, suddenly they make life worth living. Perhaps they are the comic relief you need to get through your day, or an example of what made a person in the past make it through their day. The humor transcends time. The knowledge that others have survived their times too brings a comfort as real as cocoa with Grandma. Sometimes you run into things and you wonder how anyone could live without them. Sometimes you run into things and you wonder how anyone could part with them. Family photographs, diaries, a much loved doll… You adopt them because they are worthy of a home. And it’s obvious they are not getting the respect, let alone the love, that a treasure deserves. You rescue them because no one else seems to want to. They may not be your family heirlooms, but they at least deserve to have a family. Some of us buy the treasures of others as a form of insurance: One day, sadly, all these items, near & dear to us, may end up for sale *gasp* by family members who don’t value them; maybe we can pay it forward and someone will rescue our beloved mementos. This collector hopes there are many out there that will come to rescue & adopt my treasures — each with the sense of delight of a real collector who understands these objects are not just materialistic things. One of the number one reasons for collecting is a passion for history — be it our own personal history, a sense of nostalgia for people and places just at our memory’s edge, significant world history, or some other stop along that continuum. When we collect, we do not merely posses objects and clutch them to our chests, we cultivate collections to capture moments in time, to understand people, places, moments… To understand our collective and personal selves. If these images reveal much about the time in which they were taken — the white shag rug of the sixties, the pro-choice poster of the seventies — they reveal more about the celebrities captured therein. Even gawking at these celebrities is worth something, for they were the icons of their day representing something larger than just themselves; they represent a culture, a time. Many are still considered icons and so they continue to tell us something of who we are even now. “Only because history is fetishized in physical objects can one understand it,” Susan Sontag wrote. In one sense, these images are themselves fetishized objects; they are fascinating curiosities. But the physical objects they capture are also historical artifacts, a way of making history concrete. Ultimately the objects we preserve tell us of human events and motivations, even if what we collect and conserve is not fully appreciated by others. Viewed this way, our collections are really private museums. Which leads me to this announcement by the USC-Huntington Early Modern Studies Institute. While these all seem rather lofty and ambitious (not to mention specifically focused on a period of antiquity ca. 1450 to ca. 1850), these questions are relevant to nearly every collector. Don’t let the big words fool you, these are applicable to your collection. I plan on proving this here, and I encourage all you collectors to do the same. Post your stories here, write about it at your own blog, or maybe even submit a paper to USC for the conference. You are the curator of your own museum; you know why it exists, what affects how you build it, and what it means. Stop right now, and look at your collection; besides ‘dust me,’ what is it telling you? And what would it tell all of us if we could see it?